The flight from Los Angeles to Orlando on Saturday ended up being pretty non-eventful, fortunately. We were a bit worried about whether the bad weather would start to hit Florida early enough to have any impact on our flight, but fortunately it pretty much held off until Sunday evening. This was our first trip using our Disney Vacation Club (DVC) points and we checked into our 1-bedroom villa at the Wilderness Lodge around 7pm or so Florida time. We had a nice dinner with my Orlando-area family at one of the hotel restaurants (Whispering Canyon) that evening, but otherwise turned in fairly early after being exhausted from the travel day and the loss of sleep due to being so nervous about the trip the night before. For our trips to Walt Disney World, we tend to do quite a bit of pre-planning as to where we are going to be on any given day. This is mainly to accommodate the need for reservations at table-service restaurants, but we also find it helpful for general time budgeting. On Sunday, our plans called for us to spend the day at Disney/MGM Studios (now known as Disney’s Hollywood Studios) with lunch reservations at one of the park’s sit-down restaurants (Sci-Fi Dine-In, I think). Since the weather was clear in the morning and the storm wasn’t really expected to hit until late in the day, we went forward with that plan, meeting up with my family at the park not too long before our lunch reservations. The weather that day really did feel like pretty much the definition of the cliched “calm before the storm”. For most of the day, it was extremely hot and humid, with air that felt almost eerily still. While the park wasn’t deserted that day, it wasn’t overly crowded either and everyone there did seem pretty wary of the situation and pretty focused on the weather. Around 6pm, the weather started taking a definite turn for the worse. In a fairly short time, it shifted from a pretty major stillness to a noticeable (but still not very strong) wind. The dark cloud patterns in the sky did have a look about them that definitely seemed to suggest that something was coming. The humidity was continuing to increase such that it definitely felt like rain would be arriving fairly soon. This started around the time that we were headed over to ride “The Great Movie Ride” and we ended up stopping at a gift shop first to purchase several rain ponchos, one of which we used to cover up our stroller before parking (we also parked under as much cover as we could manage). It wasn’t raining when we got off the ride, but we still wanted to be safe instead of sorry. 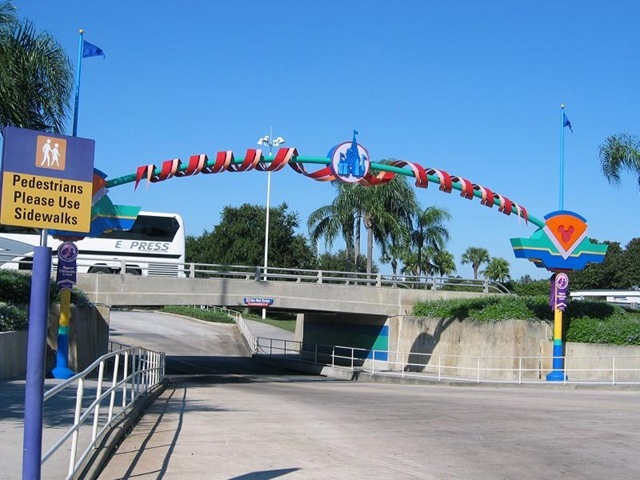 One of the main reasons why we had chosen Disney/MGM Studios for that first day was that the park was scheduled to stay open later for hotel guests as part of the “Extra Magic Hours” program. We initially held on to the idea of sticking around later and started looking around for somewhere to get dinner. We found that there wasn’t really all that much opened, though, despite the fact that it was the typical dinner hour. I was never really sure if that was fairly normal for that park or if they were starting to close things down early for the weather, although I had a hunch it was fairly normal. For one thing, they were still distributing the Extra Magic Hours wristbands (required to stay in the park) and also were still indicating that the night-time “Fantasmic!” shows were still expected to run. Even under the best conditions, we aren’t that fond of the counter-service options at that park and finally decided that maybe it would be wise to get back to our hotel before the weather got worse anyway. Therefore, we decided to leave the park around 7:30pm to head back to the Wilderness Lodge for dinner at Roaring Fork, the hotel’s fast food place. It actually started pouring rain while we were on the bus back to the hotel. After a fairly quick dinner with my parents at Roaring Fork, they headed out so that they could get home before the storm really hit. Our original plans for Monday were to spend the early part of the day at Disney’s Animal Kingdom and then head over to the Magic Kingdom for dinner at Tony’s Town Square Cafe and to see the nighttime parade and fireworks. We were pretty uncertain about how long it would take for the storm to move through and when/if the parks would re-open, though, so we left open any plans for meeting up the next day, instead planning to connect via phone/email in the morning. We then stopped at the hotel shop to stock up on some pre-packaged food (at seriously inflated prices…) from the hotel shop, just to be safe. The DVC villa had a full kitchen, so that eating a meal or two in our room on Monday was an easy option if needed. We actually didn’t end up using the food we purchased and, instead, gave it to my parents before we left town, but at least we had it if we needed it. We then headed back to our room to ride out the storm. By this time, it was fairly late in the evening (around 9pm) so our first order of business was getting our son off to bed after the fairly long day. The separate bedroom in the DVC villa was particularly nice in this case as it allowed us to put our son to bed in the living room, but still watch storm coverage on the bedroom TV without disturbing him. He is a really sound sleeper and never seemed bothered at all by the storm, even as the wind really picked up and the thunder and lightening became more intense. My wife and I did end up staying up pretty late, monitoring the situation. In addition to watching the news coverage on the TV, we also had our laptop computer with us, which allowed us to get information via the Internet. I also periodically posted “on the scene” reports to a couple of Disney-related discussion boards. My posts from that night to the MousePad discussion boards on Mouseplanet.com can be found in this thread (my handle there is “JeffG”). The DVC villa was really a rather nice place to wait out this kind of storm. Despite the intense weather outside, the room remained warm and comfortable. We never had any power outage (at least that we knew of), which certainly helped in this respect as well. The villa (like all the 1-bedroom DVC villas) had a big whirlpool bathtub that also provided some very welcome relaxation during the rather tension-generating situation. If I remember right, exhaustion did finally overwhelm the tension around 1am or so and we finally went to sleep. It was still very windy and rainy when we woke up around 10am or so on Monday morning, but it ended up being a generally fast moving storm and finally cleared the area by around noon or so. That morning, we mostly hung around the room using the laptop or watching Disney movies that they were showing on the in-room TV system. Orlando was largely on the northern edge of the storm’s path, and it had also weakened some before it got that far in-land, so damage was very minimal. We saw some downed foliage and a few knocked over signs here and there, but nothing serious. The parks and all the other entertainment areas remained closed until around 1pm, when they finally opened The Magic Kingdom and Epcot. Animal Kingdom and Disney/MGM Studios remained closed the entire day and I believe many of the other secondary areas (such as water parks and golf courses) also remained closed, although I don’t remember for certain. Officially, I believe the parks were supposed to be only opened to hotel guests, but I don’t think they really enforced that. I think that was more of an announced policy intended to discourage people from driving over to the area unnecessarily. Once the storm had passed, we ventured over to Roaring Fork for lunch before heading to the Magic Kingdom around 3pm or so. The park was the most uncrowded that I’ve ever seen for any WDW park. My parents did drive in to meet us at the park and were particularly marveling at the empty parking lot and Ticket and Transportation Center. He couldn’t resist taking the below picture of the usually very busy road and pedestrian walkway completely deserted. Every attraction was pretty much a walk-on that day. We could have probably used the opportunity to hit all the major headliner rides over and over with little to no wait, but we were instead largely pacing our day around our son’s interests. That meant that we mostly focused on the Fantasyland rides and on other kid-friendly attractions like the Tomorrowland Speedway and the Tomorrowland Transit Authority (Peoplemover). He seemed to really have a lot of fun visiting the Magic Kingdom rides with little to no wait. We did make it to our reservation at Tony’s for dinner that evening, although it was slow enough that we probably could have gotten in to any of the table-service restaurants as walk-ups without much of a wait. Even better, that evening we were able to walk right up and find uncrowded spots in the hub for both “Spectromagic” (the parade) and “Wishes” (the fireworks show) pretty much right before their scheduled start-times. For the fireworks, it felt especially strange standing in pretty much the most in-demand viewing location with only a few other people around us. That was definitely a rare experience. The rest of the week, the parks continued to be fairly uncrowded, although more crowded than on Monday. A visit to the Universal Orlando parks later that week found those parks to be especially empty, although I understand that is actually fairly common there that time of year. The weather also remained very nice for the rest of the week and, in fact, the hurricane largely seemed to have an effect of blowing away a lot of the heat and humidity. As is typical after any big event like that, there was a bit of a “shared experience” atmosphere and we found ourselves pretty regularly drawn into chats with other guests about the hurricane experiences. One thing we noted was that quite a few people at the parks later in the week were actually from South Florida, having headed up for impromptu Orlando visits while hurricane damage was being repaired back home. Overall, I wouldn’t really say that our experience vacationing during a hurricane was anywhere near the negative one that we thought it might be. I can even say that the hurricane ended up having certain advantages for us when it came to crowd sizes and weather once the storm had passed. I do think we were fortunate that the storm was fast moving and didn’t hit Orlando as directly as some of the others have. There was definitely the potential that the storm could have resulted in a much more significant disruption to our vacation. We did learn that Walt Disney World seemed to be extremely well-equipped to handle this kind of storm, though, so I also would probably not be too quick to cancel a trip on the threat of a hurricane. Lets keep our fingers crossed that Fay turns away. It is a rare occurrence, thankfully, that these storms turn into a devastating hurricane causing widespread damage. Fay was really nothing more than a big wet inconvenience for us here in Orlando. The east coast of Florida was much harder hit, and had quite a bit of damage – although mostly from flooding due to heavy rain fall and from tornados that spawned from the storm system. Fortunately we didn’t have any damage in the parks that I’m aware of, but we lost a ton of revenue from cancelled vacations and guests who left early or didn’t come into the parks at all because of the wind and rain.